Beale Street Landing, downtown Memphis, is the home for a historical marker that honors two places. The following is the text for the marker. In the earliest days of Memphis, the Astoria Fur Company built a trading post at the top of the bluff near Beale Street. By 1823, when westward exploration drew commerce across the Mississippi River, the trading post likewise moved west. The land and building were given to the city. The land, which extended to the river’s edge, remained undeveloped and later newspaper accounts reported that the river was gradually eroding the property. When Riverside Drive was created in the 1930’s this eroded land lay between Beale and Linden Avenue to the south and was only visible at low water. 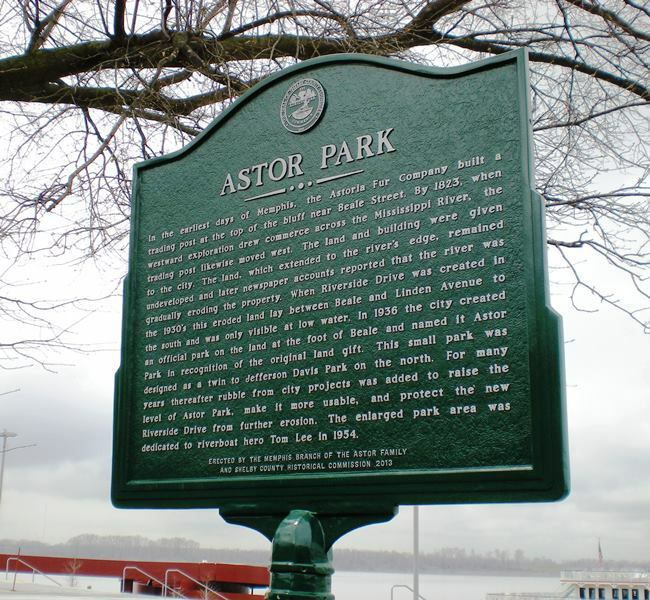 In 1936 the city created an official park on the land at the foot of Beale and named it Astor Park in recognition of the original land gift. This small park was designed as a twin to Jefferson Davis Park on the north. For many years thereafter rubble from city projects was added to raise the level of Astor Park, make it more usable, and protect the new Riverside Drive from further erosion. 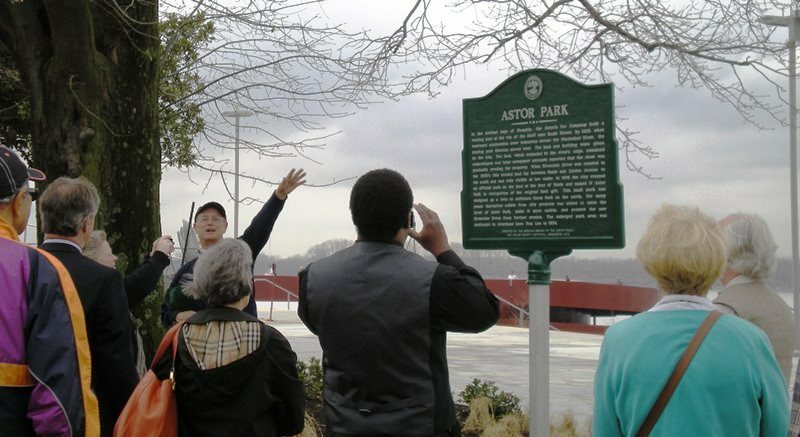 The enlarged park area was dedicated to riverboat hero Tom Lee in 1954. Before the completion of Riverside Drive in 1936 the cobblestones at the foot of Beale Street were home to several boat supply stores. These stores, built on anchored barges, served countless vessels, passenger and freight, traveling the Mississippi River. Supplies and groceries were sent by small boats into the river channel solving the problem of landing the larger vessels and allowing these vessels to continue their journey up or down the river unimpeded. During the 1950’s, Italian immigrant Charles Garavelli became one of the principal boat supply store owners. Garavelli, a founder of the WeOna grocery collective, traded both on land at WeOna #2 and on the river at Memphis Boat Supply. His barge was anchored closest to the Astor Park site. 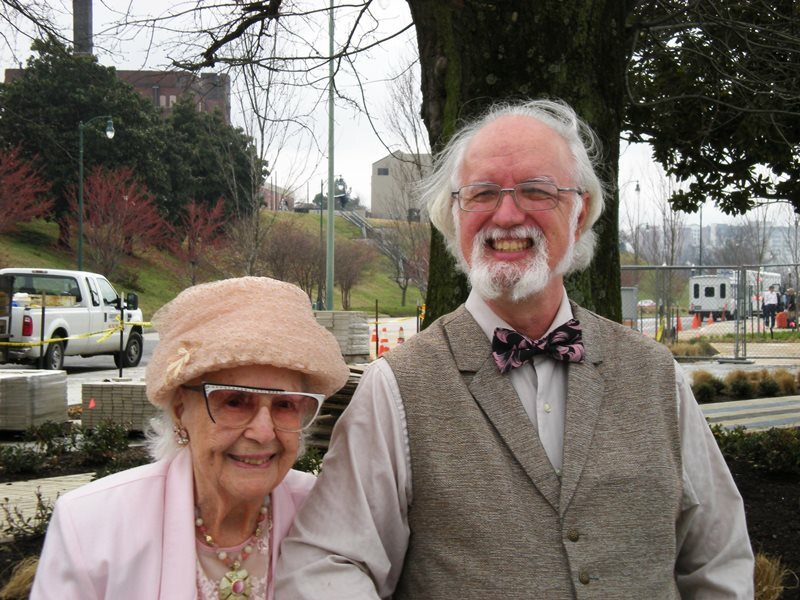 Garavelli’s daughter, Angela Estelle Garavelli, married Vincent Finis Astor, of the Memphis Astor family. 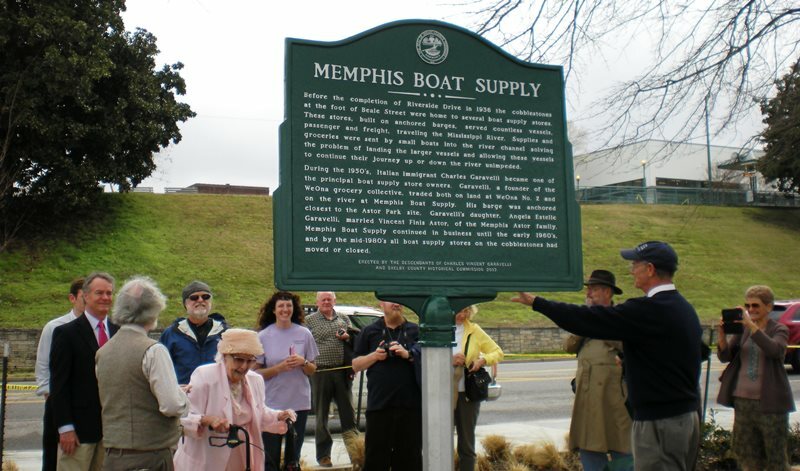 Memphis Boat Supply continued in business until the early1960’s, and by the mid-1980’s all boat supply stores on the cobblestones had moved or closed.